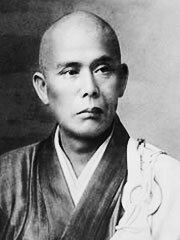 Soyen Shaku (1859 – 1919; sometimes written as Soen Shaku or Kogaku So’en Shaku) was the first Zen Buddhist master to teach in the United States. He was a Roshi of the Rinzai school and was abbot of both Kencho-ji and Engaku-ji temples in Kamakura, Japan. Shaku was a disciple of Imakita Kosen. Soyen Shaku was an exceptional Zen monk. In his youth, his master, Kosen, and others had recognized him to be naturally advantaged. Three years after he had received “Dharma transmission” from Kosen at age 25, Soyen took the unique step of traveling to Ceylon to study Pali and Theravada Buddhism and live the alien life of the bhikkhu for three years. In 1893 Shaku was invited by John Henry Barrows to attend the World Parliament of Religions in Chicago. Along with Anagarika Dharmapala and others, Shaku was considered authoritative to speak to the West on behalf of the world’s Buddhist community. He addressed the conference that September with a series of talks, notably about karma, nonviolence, an end to war and tolerance of other religions. At this conference he met Dr. Paul Carus, a publisher from Open Court Press in La Salle, Connecticut. Before Shaku returned to Japan, Carus asked him to send an English-speaker knowledgeable about Zen Buddhism to the United States. Shaku, upon returning to Japan asked his student and Tokyo University scholar D. T. Suzuki to go to the United States, where he would eventually become the leading academic on Zen Buddhism in the West. Despite his anti-war statements, Soyen served as a chaplain to the Japanese army during the Russo-Japanese War, which he believed to be a just cause. In 1904, the Russian author and pacifist Leo Tolstoy wrote Shaku in the hopes that he would join him in denouncing the war. Shaku refused, concluding that «.. as a means of bringing into harmony those things which are incompatible, killing and war are necessary.» (quoted in Victoria, 1997) After the war, Shaku would attribute Japan’s victory to its samurai culture, which he traced back to the nation’s amalgamation of Buddhism, Confucianism, and Shinto. In 1905, Soyen Shaku returned to America to help establish Zen in the West, staying for roughly one year in San Francisco and Seattle. Shortly after arriving, he was joined by his student Nyogen Senzaki. Ultimately, Senzaki would became a permanent resident and Zen teacher in Los Angeles. Soyen Shaku died 29 October, 1919 in Kamakura.